The Defence Procurement Procedure 2016 (DPP 2016) lays a great emphasis on indigenous content (IC) in the equipment it procures under various categories, except for the Buy (Global) category under which fully-formed equipment is bought directly from the foreign vendors. This category does not entail any manufacturing in India, but this disadvantage is made up through offsets. The objective of both these features of the procurement procedure is to promote the defence industry in India. It is difficult to say how far these objectives have been/are being met but ironing out of some procedural complexities that bedevil the industry could arguably produce better results. (d) Taxes, duties, cesses, octroi and other statutory levies in India of this nature. This provision could potentially be circumvented by the vendors by buying foreign-made materials, components, etc. imported into India by a third party and passing them off as indigenously procured material. An elaborate system of reporting is prescribed in DPP 2016 to prevent his. Accordingly, the IC calculated as per the above-mentioned formula is required to be 'reported by all stages (tiers) of manufacturing/production/assembly to their higher stages (tiers)'and all 'stages (tiers) are required to aggregate (the) indigenous content based on certifications and inputs from the lower tiers, as well as on the basis of their own procurement actions and manufacturing activities undertaken'. The 'final aggregation of IC shall be undertaken by the prime (main) contractor with whom an acquisition contract is signed by the Ministry/SHQ'. These DPP further provides that all 'contracts, sub-contracts, agreements and MoUs made by (the) prime (main) contractors (and their lower tier suppliers/vendors) with their business partners/ suppliers, in so far as these contracts, agreements or MoUs relate to the main acquisition contract, shall mandatorily incorporate the right of the Ministry of Defence to conduct an audit…' and 'these business partners/suppliers shall sequentially incorporate these definitions and reporting requirements with their next levels of business partners / suppliers and so on till the lowest tier in the manufacturing / production / assembly chain'. Simply stated, what it means is that the agreements signed by each tier with the next lower tier in the value chain will have two clauses: one which binds the lower tier to intimate the extent of IC in the material being supplied by him to the higher tier (calculated as per the above-mentioned formula) and the other which binds the lower tier to provide access to his books of account to the MoD for the purpose of audit, if required. Many consider this method of arriving at the indigenous content to be faulty as it places a premium on the monetary value of goods and services of Indian origin used in manufacturing the equipment and not on indigenously developed technology that goes into it. There is some merit in this argument. It is undoubtedly more important from the point of view of strategic autonomy that the technologies that go into manufacturing of defence equipment are indigenous. This will insulate India from becoming the direct or a collateral victim of sanctions often imposed by some of the current technology providing countries. But developing a matrix for incentivising technology development as a part of the IC requirement is a challenge that will have to be met before this seminal change is made in the approach for calculating the IC. Not much effort has been made in this regard. Be that as it may, the method for calculating the IC prescribed in DPP 2016 is not unreasonable, or even cumbersome. The procedural requirements laid down in DPP 2016 to measure the required extent of IC in the final product have, however, made the system complex and painful for the prime contractors. The first complexity arises from the fact that the IC is required to be calculated not just with reference to the total value of the contract but also with reference to some individual elements of the overall cost. The DPP 2016 says that apart from the specified overall IC, the same percentage of IC will also be required in the (a) basic cost of the Equipment, (b) cost of the Manufacturers' Recommended List of Spares (MRLS), and (c) cost of the Special Maintenance Tools (SMT) and Special Test Equipment (STE), taken together at all stages, including Field Evaluation Trials (FET) stage. This effectively means that the required overall level of IC must be achieved with the help of only three elements of the overall value, excluding other elements like training, documentation etc, the cost of which is otherwise included in the overall value. A further limitation arises because freight, insurance and custom duty etc. are also not considered as a part of the value added in India. This makes it difficult for the prime vendor to meet the required level of IC, apart from making it administratively cumbersome for the contract officer to ensure compliance. The second issue concerns the requirement of demonstrating the prescribed level of IC in the equipment produced for the FET. It needs to be recalled that the cost of bringing the equipment to the test site and deputing the manpower to participate in the trials is incurred by the vendors. These trials are carried out on no-cost-no-commitment (NCNC) basis. It often takes a long time for the contract to be concluded after the trials are over. As a matter of fact, FET is no guarantee that the contract will be concluded. In any case, not every vendor who produces the equipment for FET can expect to win the contract. In these circumstances, it is unreasonable to expect all vendors to invest in achieving the requisite level of IC in the prototype to be produced for trials. The third issue concerns the Indigenisation Plan that the vendors are required to submit in all Buy (Indian Designed, Developed and Manufactured), Buy (Indian), Buy and Make (Indian) and Buy and Make cases to demonstrate how they propose to meet the specified requirement of IC. It is not clear what does or can the MoD do with this information. There seems to be no use for this information in the MoD. More importantly, submission of a plan could possibly make it difficult for the vendors to refine it as and when required to meet the challenge of achieving the required level of IC. The requirement of submitting the Indigenisation Plan, therefore, appears to be not only unnecessary but also potentially countrer-productive. The fourth issue concerns audit of IC claims, withholding of payments and imposition of penalties. The contract between the MoD and the vendors allows the former to exercise the right to conduct an audit at any stage of manufacturing /production/assembly in respect of any certificate of IC or related cost submitted by the prime vendor or any of his sub-vendors down to the lowest tier. This audit can be carried out by the MoD itself or any institution/agency/officer(s) nominated by it. The ministry does not have the wherewithal to carry out such audits and no guidelines have been evolved either to select outside agencies for this purpose or for the audit parties to carry out the audit in an objective and fair manner. According to another provision in the DPP, in case 'a particular delivery is deficient in achieving mandatory IC for that stage, an amount of 5% of the cost of that stage delivery shall be withheld from payment for that stage'. It implies that a substantial amount could get withheld even if there is a one per cent deficiency in the IC. The fact that the withheld amount is released if the vendor achieves the mandatory IC on a cumulative basis by the next stage of delivery is of little help as no interest is payable for the duration for which the amount remains withheld. The provision in the DPP for imposition of penalties in the event a false IC certificate is given by a vendor or if he fails to achieve the mandatory IC is particularly harsh. In such cases, MoD can initiate proceedings for banning or suspension of business dealings with the erring vendor and its allied firms for all future contracts for a period up to five years. This right can be exercised by the MoD 'at any point of time', in addition to 'any other action that may be taken/ordered by the Ministry against the erring vendor/sub-vendor under any law(s) in force'. The existing system does not recognise that some genuine unforeseen contingencies could come in the way of achieving the desired level of IC. The issues highlighted above only indicate that the focus of the DPP is more on the regulatory aspect of the policy on IC rather than enabling the vendors to achieve the desired level of IC. Hopefully, the next edition of the DPP will address these concerns pragmatically. The offset contracts and determination of quantum of offset credits are typically subjected to a lot of scrutiny from the MoD and the value of the offset components for which offset credits are sought has to be supported by documentary evidence, as may be required by the relevant government authorities. The definition and method of determination of indigenisation in terms of Indian Value Addition (VA) shall be applicable at program level to all defence procurements, including but not limited to procurements through DRDO, DPSUs, PSUs, Private Industry, Indian Offset Partners (lOP) of Foreign Primes. For this purpose the Taxes and Duties should be separately declared, and paid to domestic Industry at actual whether as prime contractor or as lOP (through the OEM in case of Offsets). Any activity which does not add creat capability in Indian Industry has been excluded. The general principle being that only the value addition undertaken by the IOP in India is counted towards offset obligations of the main foreign vendor, while the value of imported components and fees/royalties incurred by the IOP does not count towards the value addition and consequently the offset obligations of the foreign vendor. 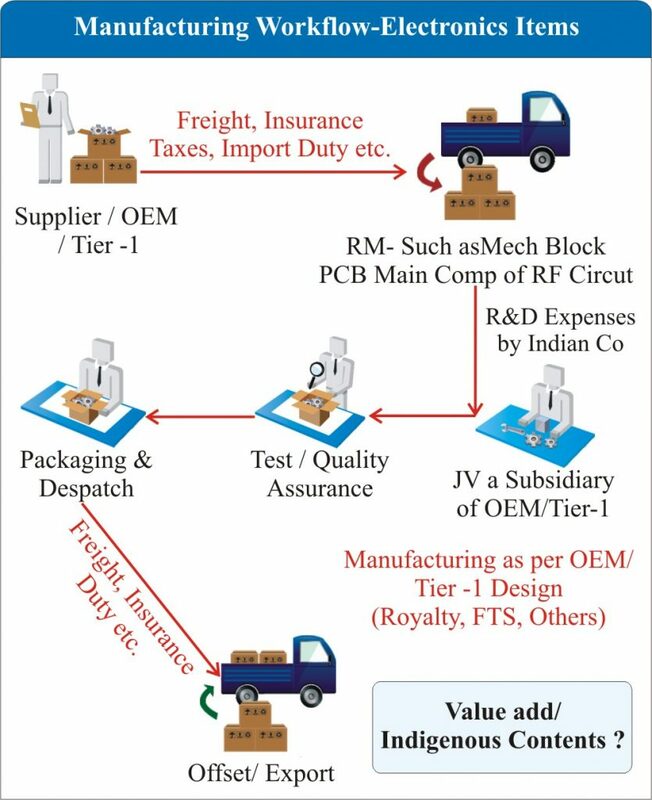 The diagram below shows the manufacturing process by a subsidiary JV and value addition in electronic item beside other expences it may have to pay. Some of non value adding entities have been shown in Red. As for License fee or technical fee or Brand fee, such manufacture of parts/components cases are under “Built to Print” and can not be considered as adding any capability to Indian industry. The supporting documents to claim value addition include submission of a 'Certificate of manufacturing and Value addition duly signed by CFOs of OEM and IOP'.